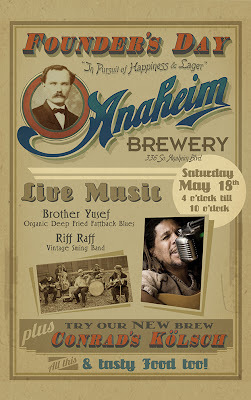 ANAHEIM HISTORICAL SOCIETY: ANAHEIM BREWERY "FOUNDERS DAY" ON MAY 18th! Birthdays are always a great reason to celebrate, so join us in wishing a Happy 164th Birthday to Friedrich Conrad, proprietor of the Anaheim Brewery from 1872 to 1904. Friedrich was born in Bavaria, Germany, in 1849, and arrived in San Diego in 1866 where, as a boy of seventeen, he set up shop as a cooper (barrel maker). Friedrich moved to Anaheim in 1870 and opened a winery. Two years later, he opened the Anaheim Brewery. 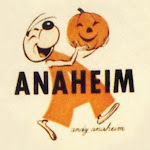 Of course, no brewer’s birthday celebration would be complete without a special beer, and, of course, the Anaheim Brewery has brewed one: “Conrad’s Kolsch” is styled after the top-fermented beers of Koln (Cologne), Germany. It is a light golden, pleasantly hoppy ale. The label is an interpretation based on a fragment from an Anaheim Beer label dating from the early 1900’s, skillfully recreated by artists Kevin Kidney and Jody Daily. “Conrad’s Kolsch” will be available in bottles, growlers or draught. The Anaheim Brewery is located at 336 S. Anaheim Blvd. in Historic Downtown Anaheim.